The “Crystalline” model is characterized by a magnificent round case and some 800 crystals form the perfect pavé detailing with a diameter of 40 mm. The beauty of this watch lies in the case, subtly punctuated by the Swan logo mark at 12 o’clock and three index markers, which are also metalized on the sapphire glass. Sobriety also reigns over the dial, which is simply signed with the company name. In the middle, two elegant faceted hands turn above the white silver sunray colored dial for the “Crystalline White” model, the version with the white calfskin leather strap and ardillon buckle. The silver structured fabric strap is topped with a rhodium-plated mirror in the center of the dial for the “Crystalline Silver” model, while the black calfskin leather strap complements a black lacquered dial for the “Crystalline Black” model. All three will be available from March 2012. “Crystalline Red” is yet another fine example featuring a red dial and strap, providing the same elegance for the festive season, available worldwide from September. 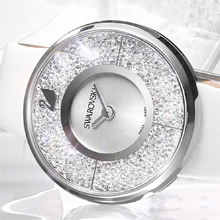 This feminine “Crystalline” watch combines an ultra-fashionable trend with the function of a timeless watch and is certain to please the active and elegant woman. 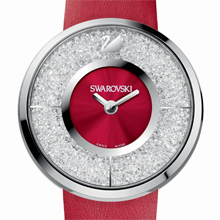 Round stainless steel case, 40 mm in diameter, filled with around 800 clear crystals, water resistant to 30 meters. 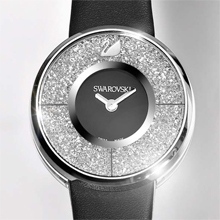 White silver sunray colored, rhodium-plated mirror, or black lacquered dial, faceted hour and minute hands. Swan logo mark at 12 o’clock. Strap in gray fabric, white or black calfskin leather, stainless steel ardillon buckle. Swanflower® motif and crown on the back of the case.